I cannot wait to relax and watch the video with a nice cup of tea! OMG, you made that insanely adorable chibi reylo? Can you post the original? It's too cute for words. Yaass it's adorable!! <3 Thanks so much @lauvamp! I just want to say that I'm new to this podcast and I really, really love it. I've listened to the literature ones more than once already and sent them to my mom who also loves Star Wars and the books discussed in question. SO many great comparisons, but I gotta say that the whole comparison of Wuthering Heights as a parallel to the generational narrative that is Star Wars (ie. Heathcliff and Cathy done screwed it up like Anidala, and Hareton and Cathy Jr./Reylo are going to fix it) literally blew my mind. Something that I don't think was mentioned but was a little thought-nugget: you compared the Resistance to the Rivers' in Jane Eyre and that sense of belonging but not quite, and that was awesome. However, I also thought, in addition to this (because the ST is really firing on a lot of different levels and with a lot of different texts) there might also be the potential of someone to also be the Mr. Wickham to Kylo's Darcy in the Resistance as well. ie. there could be one of them (or more than one) who tries to get her to think badly of him but who Rey ends up seeing through (likeliest option is Poe, who actually has a connection to Leia and might actually know a bit of Kylo/Ben's backstory). Just a thought. I loved ALL the comparisons you did make! @nickandnora wrote: I also thought, in addition to this (because the ST is really firing on a lot of different levels and with a lot of different texts) there might also be the potential of someone to also be the Mr. Wickham to Kylo's Darcy in the Resistance as well. ie. there could be one of them (or more than one) who tries to get her to think badly of him but who Rey ends up seeing through (likeliest option is Poe, who actually has a connection to Leia and might actually know a bit of Kylo/Ben's backstory). Just a thought. I loved ALL the comparisons you did make! 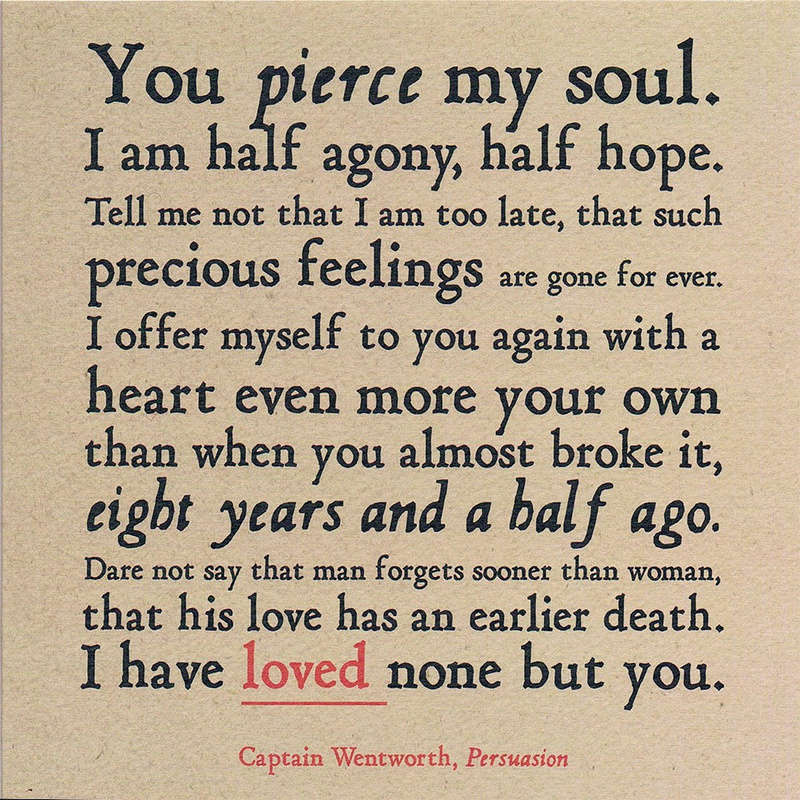 I watched the BBC version of P&P just last week. Poe as Wickham was most definitely one of the first things that crossed my mind, and I wouldn’t be shocked at all if JJ went that route. I seriously hope we don’t get any type of ‘love triangle’, even if it’s obvious who Rey will choose. Still, this scenario seems very very plausible. Or on a more comical note, if Poe is indeed Wickham, maybe Finn is Lydia? In today’s episode we talk about the parallels between the Rey and Kylo Ren dynamics in the Star Wars sequel trilogy and seminal works of classic British literature. We begin with a focus on Pride and Prejudice, overviewing the similarities between the character design of Kylo Ren and the much beloved Mr.Darcy. 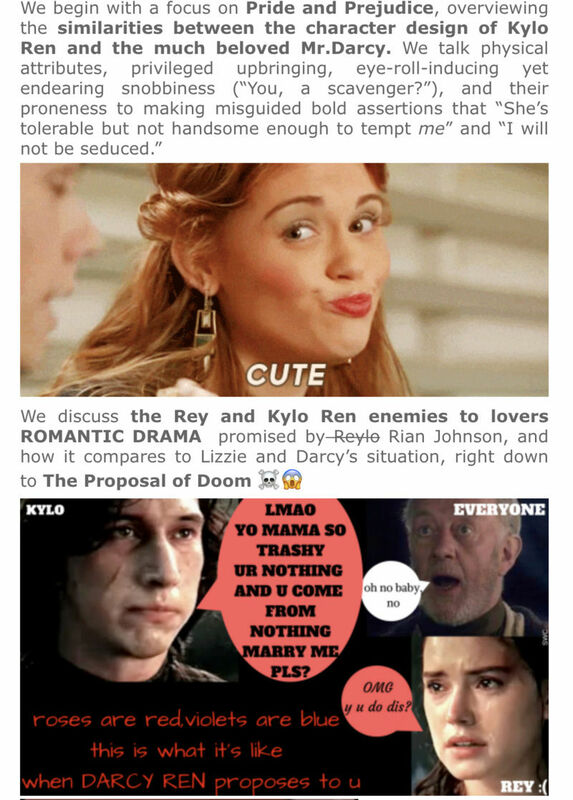 We discuss the Rey and Kylo Ren enemies to lovers ROMANTIC DRAMA promised by Rian Johnson, and how it compares to Lizzie and Darcy’s situation, right down to The Proposal of Doom. In our overview of other key literary references, we briefly discuss Wuthering Heights and its parallels to Reylo - but not in the way you expect. We also talk the Anne of Green Gables and West Side Story Reylo connection. We overview how themes of the heroine’s journey, female sexual awakening and exploration vs repression, virtue vs debauchery are portrayed in works like Jane Eyre, Sense and Sensibility, North and South, Pride and Prejudice - and in Rey’s character arc in the ST.
We discuss the revolutionary portrayal of female agency in works like Jane Eyre, and why agency is an essential character trait in Rey. We believe that Rey and Ben’s separation at the end of TLJ is a painful but necessary development to establish Rey’s independence. It is also a necessary catalyst for Kylo Ren’s further character development and their eventual romance. Lastly, we contrast the approach to romance in Jane Austen’s work, including novels like Fanny Price and Persuasion, with Charlotte Brontë’s approach in Jane Eyre, and how it ties in with the Reylo dynamic. 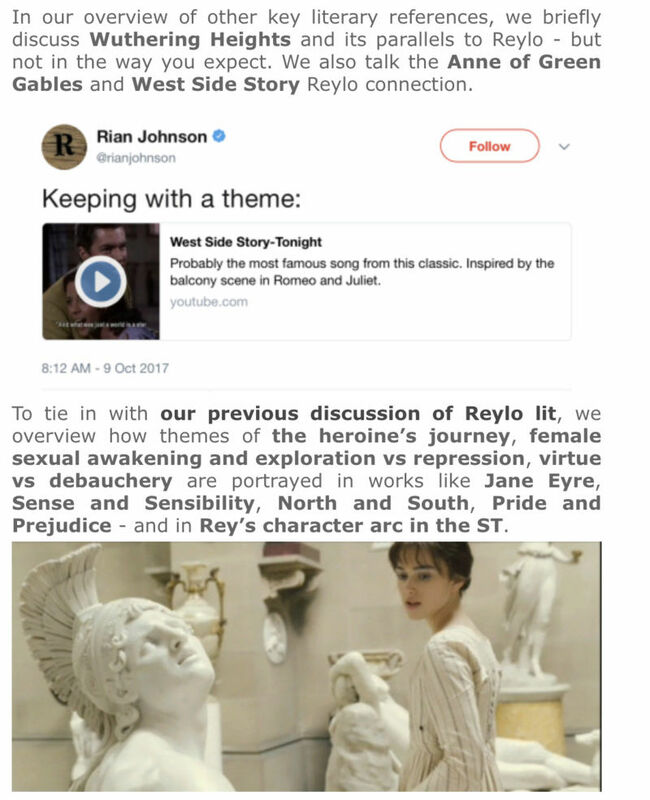 This is part 2 of our Literary References in Reylo podcast series. Part 1 of our discussion centers on Jane Eyre and North and South. You can find it here. This is the video I'm looking for.. can't wait to listen to it! You know, I was actually thinking that Finn and Rose can be Bingley and Jane, and Ben does something to help them, the way Darcy did to atone to Elizabeth. But seriously I hope we don't get a Poe/Rey/Ben triangle. Poe is taking up enough screen time as is for a character who wasn't even supposed to make it out of TFA alive. The antis would also be unbearable. Just let him lead the Resistance and fight Hux in pew pew pew scenes. @Star Wars Connection I'm listening to the podcast right now and loving it. Good point about Cathy Jr. and Harreton as being similar to Reylo. I also didn't think that Sense and Sensibility could be compared to SW/Reylo... very interesting. The thing I like about Elizabeth/Darcy/Wickham though is that it's not an actual love triangle (I myself also hate love triangles). He's more of a sounding board and confirmation of her worst suspicions about Darcy, as in: "Yes, that guy's an a**, let's talk about that!" but it quickly moves to: "Huh, you're kind of sketchy, but OK" to "Oh my god, are you seriously talking smack about Darcy when you're the WORST and I LOVE him?!" To me that's the equivalent of siding with Poe at first because he's with the Resistance and for no other reason, but then it quickly devolves from there. I believe someone else once also compared the potential dynamic to Belle/Gaston/Beast, and I also think they could totally make that work as well. @rawpowah wrote: @Star Wars Connection I'm listening to the podcast right now and loving it. Good point about Cathy Jr. and Harreton as being similar to Reylo. I also didn't think that Sense and Sensibility could be compared to SW/Reylo... very interesting. Count me in as someone who doesn't want to see a love triangle between Ben/Rey/Poe. We've got enough to sort through as it is without triangles, ain't nobody got time for that. My read of it is that Lizzie had a massive crush on Wickham at one point in the story, so it is sort of a love triangle. It was never anything more profound than a crush, but she had "her head full of him and couldn't think of anything else" if I recall correctly - there are lots of references to how taken she is by him throughout the story, until she finally sees through him. Even her dad teases her about Wickham at one point. For me that dynamic is distinctly different from the Caroline Bingley/Darcy/Lizzie situation, because although Caroline and Lizzie are set up as rivals for Darcy's attention, it was never a contest to begin with so there is no love triangle. Darcy always saw through Caroline, imo. He throws subtle shade at her when he says that he's not into women who are catty (I'm paraphrasing lol). I honestly don't think there will be any love triangle. those things are set up from the start, not in the last 1/3 of the story. Finally managed to grab an hour to listen to your podcast. Thoroughly enjoyed listening to all your insights into the comparisons with the various books. I've read all the ones you've discussed, although it was a bit of an eye-opener to realise the last time I read some of them would have been over 30 years ago! Pride and Prejudice is a constant, one I've read many times, in fact I think I've read all of them at least twice. I've always enjoyed Jane Austen's perspective take on human nature. I suppose without the modern day distractions we have in our day, in Jane's day it would have been much easier to people watch, and build the characters she has within her books. @Star Wars Connection Did you do the podcast of Pride and Prejudice? I love Jane Austin ! It is certainly one of my favorite books. Congratulations for what you do. Great work! 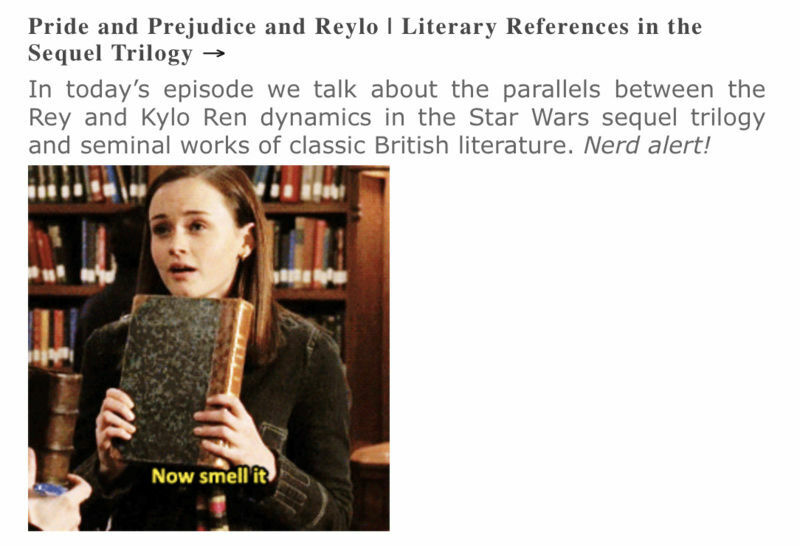 @giaciak2 wrote: @Star Wars Connection Did you do the podcast of Pride and Prejudice? I love Jane Austin ! It is certainly one of my favorite books. Congratulations for what you do. Great work! 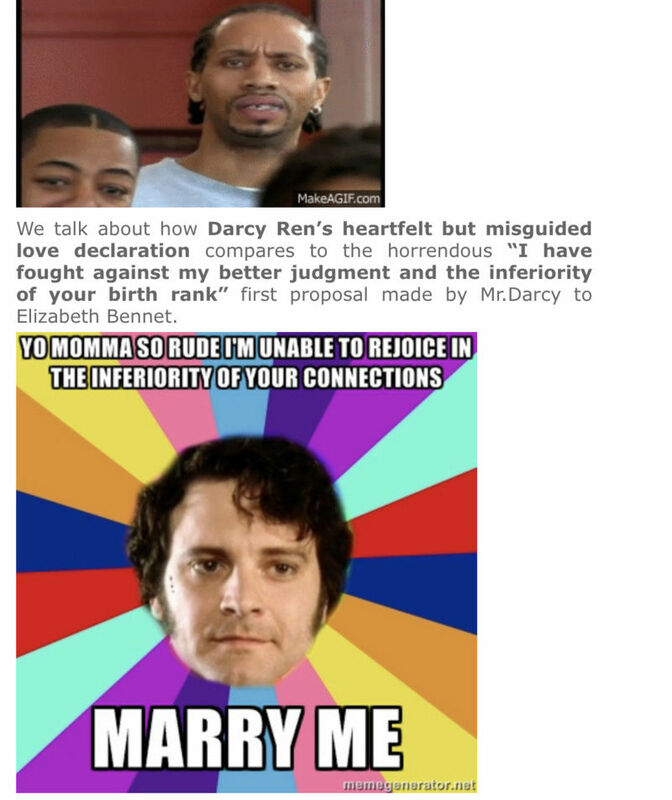 That "yo mama so rude" Darcy meme cracks me up every time. We also have enabled the really really bad automated subtitles. It transcribes REYLO into RELOJ, which is clock in Spanish, but it's still probably better than nothing. Wow I loved the comparison of reylo to catchy and hareton, as opposed to cathy and heathcliff. Brilliant! Couldn't get into the stories, Cathy and Heathcliff don't interest me but I do remember thinking cathy and hareton were great. ALSO omg I freaked out when the Mariah Carey song I Still Believe came up beccausee I recently rediscovered my love for that song and I kept thinking omg this is my reylo ballad right here!! And then it's mentioned here! Glad I wasn't the only one wooh!! If anyone needs a beautiful uplifting reylo song, this is IT!